It’s a movement that’s creating synergy across the globe – one that involves entrepreneurs, small-businesses and market disrupters – all changing our world one business at a time. Once a concept mandated due to lack of resources and technology, the concept of buying local is the new mantra. It’s a fact that small-businesses support the economy more so than the behemoths that exist amongst us. Sure, we need both models to retrieve goods and services we desire as a consumer, however, there’s another layer to the shift. That is, authenticity. People, more than ever, seek authentic experiences and places – something that is completely lost upon the behemoths. People seek value more than ever, and adding an authentic, unique service, product or experience seems to be winning over the alternatives. 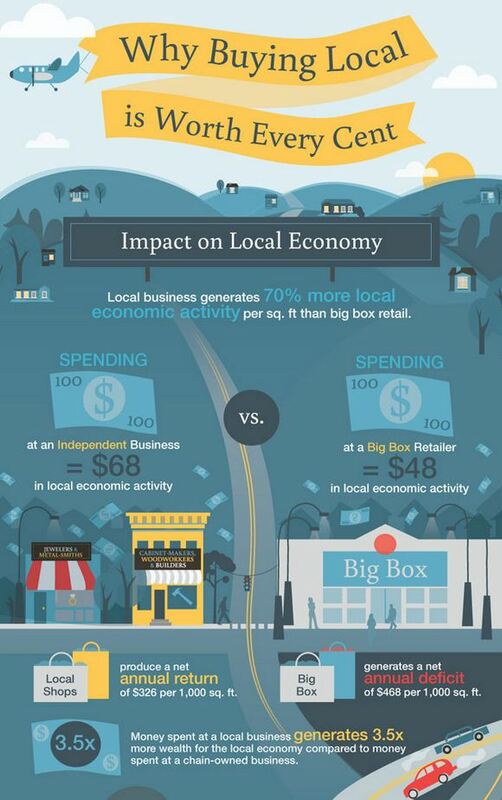 Take a look at the infographic below that tells the entire story of the small business. Vinously Speaking fans and supporters are continuously involved in this movement and have experienced first hand our authentic, unique experience. You can expand your involvement with us and be directly involved with the movement by supporting our efforts to expand to the best wine bar in town. Thank you for being passionate about small business and authentic experiences.